New research which is now published in the journal Scientific Reports examines and highlights the importance of regular bedtimes for optimal heart and metabolic health. Going to bed at the same time each night may keep both your heart and metabolism healthy. The cardiometabolic health risks linked to sleep deprivation are numerous. These health risks include weight gain, insulin resistance, type 2 diabetes, high blood pressure, and heart disease. Going to bed and waking up at the same time every day, however, is also vital for health. A study from last year reported that "social jet lag" — that is, the difference in sleep and waking times between the weekend and the weekdays — can also raise the risk of heart disease. Previous studies have also suggested that obesity and diabetes may be on the cards for those who hit the snooze button on weekends. Now, new research from the Duke University Medical Center in Durham, NC, adds to the mounting evidence suggesting that regular bedtimes are key to a person's heart health and the good functioning of their metabolism. Jessica Lunsford-Avery, Ph.D. — an assistant professor in psychiatry and behavioral sciences from the Duke University Medical Center — led the new study. Bedtimes and cardiometabolic health. Lunsford-Avery and team examined the sleeping patterns of almost 2,000 adults aged 54–93, who had no history of sleep disorders. The volunteers all wore sleep tracking devices that picked up on the slightest variations in bedtime patterns. The adults wore the devices for 7 days and kept a sleep diary. 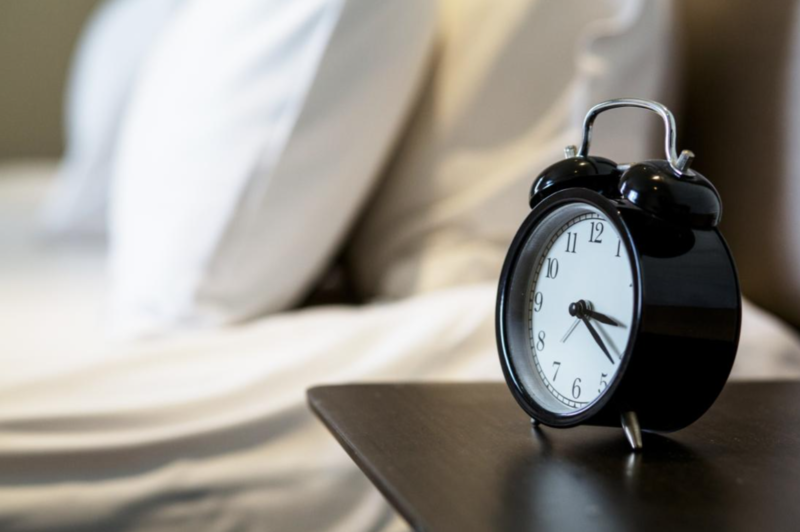 The researchers examined the link between bedtime patterns and markers of cardiometabolic risk, and they calculated a 10-year projected risk of heart disease, obesity, hypertension, and type 2 diabetes markers, such as high blood sugar and hemoglobin A1. Overall, volunteers with irregular bedtimes had a higher body mass index (BMI), higher levels of blood sugar, higher blood pressure, and higher levels of hemoglobin A1C, and they were more likely to have a heart attack or stroke in the following decade than individuals with regular sleeping patterns. Also, the volunteers who went to bed and woke up at varying times had a higher risk of depression and stress than their more disciplined counterparts. "Sleep irregularity may represent a target for early identification and prevention of cardiometabolic disease," conclude the authors. However, they also point out that their study is observational and cannot say anything about causality. "From our study," reports Lunsford-Avery, "we can't conclude that sleep irregularity results in health risks, or whether health conditions affect sleep. Perhaps all of these things are impacting each other." "Perhaps there's something about obesity that disrupts sleep regularity," she states. "Or, as some research suggests, perhaps poor sleep interferes with the body's metabolism which can lead to weight gain, and it's a vicious cycle." "With more research," says Lunsford-Avery, "we hope to understand what's going on biologically, and perhaps then we could say what's coming first or which is the chicken and which is the egg." Either way, the new findings help establish who is at risk of developing serious cardiometabolic conditions.